Australia coach Darren Lehmann has, in an extraordinary outburst against England allrounder Stuart Broad, underlined his anger over Broad's decision to not walk at a crucial juncture of the first Test by calling for Australian crowds to get at Broad in the return Ashes series later this year. "Certainly our players haven't forgotten, they're calling him everything under the sun as they go past," Lehmann said in an interview to the TripleM station. "I hope the Australian public are the same because that was just blatant cheating. I don't advocate walking but when you hit it to first slip it's pretty hard." Lehmann's comments come a day ahead of the final Test at the Oval, with Australia striving to avoid an unprecedented fourth Test defeat in a Ashes series. It might have turned out to be a closer contest had Broad walked after edging into the keeper's leg, with the ball then carrying to slip, in a tightly fought first Test. 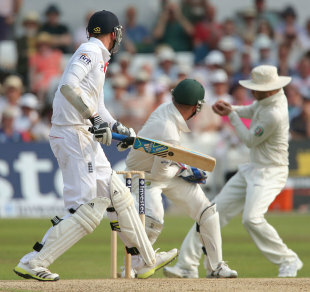 Instead, he stood his ground and was involved in a match-changing 138-run stand with Ian Bell for the seventh wicket. "From my point of view I just hope the Australian public give it to him right from the word go for the whole summer and I hope he cries and he goes home," Lehmann said. "I just hope everyone gets stuck into him because the way he's carried on and the way he's commented in public about it is ridiculous. "He knew he hit it to slip. The biggest problem there is the poor umpire cops all the crap that he gets in paper and Stuart Broad makes him look like a fool. From my point of view it's poor, so I hope the public actually get stuck into him." Broad had re-opened debate about the incident by speaking unrepentantly and brazenly about it earlier in the week. "Yes, I knew I'd hit it," he said. "But if you go through the series and look at the Australian players who have nicked it and not walked you could name several -- Warner, Rogers, Khawaja, Smith, Clarke, Agar. I mean it's quite a lot of players for it to be a big issue. Why are people picking on me? Well, it's the way our media works I suppose. "It's a bit silly when people say I edged to slip because it was actually an edge to the keeper that went off his gloves to slip. I went down the other end and Ian Bell said, "What's happened there? I didn't hear anything". And Agar asked me if I'd nicked it because he wasn't sure. It wasn't as clear-cut as everybody thought." By deciding to stand his ground, Broad said he had demonstrated the hard-edged attitude that Australia had used to great effect against England in previous years. "Australian cricket has a win-at-all-costs mentality whereas in England it can be 'let's shake hands and have a beer'," he said. "Maybe that's why they won non-stop for 20 years against us but there's one thing for sure about this England team and that is we're tough. "We've come through tricky times and have stood up to be counted. We do have a win-at-all-costs mentality. We've been accused of all sorts of things this summer, like the tripe about tape on our bats, but that's not what the series will be remembered for. It's winning that will be remembered."